Paul J. Begay is a Navajo silversmith who is in his early fifties. He worked with renowned Navajo smith Harry Morgan for some years during the time when Harry ran a production studio and employed other smiths to help him meet demand for his "old pawn" style jewelry. Paul has been working independently for several years and has retained Harry's stylistic element of applying an "old pawn" patina to his pieces, while developing his own style based on traditional Navajo designs. This design consists of a large round, multi-stone central cluster of natural, untreated Persian turquoise stones flanked by large semi-circular clusters of matching stones. The center stone in the large cluster is an archetypal Persian cut high-domed oval. Many of the other stones in this piece show this same classic Persian high-domed cut. This center oval is surrounded by eight oval stones and the border of the cluster consists of twenty more ovals. The smaller side clusters are each formed by formed by fifteen ovals for a total of thirty more stones. In all, fifty-nine ovals of wonderfully color-matched stones set in straight-edged bezels contribute to this perfectly symmetrical design. This is archetypal "Persian Blue" sourced through Armenian gem dealers in New York in the mid-1970's. This stone has been locked away in a vault in New Mexico for thirty years and this piece is one of several made from a stash which the dog sniffed out and which we subsequently cleaned out. Some of the stones show a dramatically high-domed, typical Persian cut, others are softly domed. This is the original pierre turquoise (Turkish stone) of legend (see note at bottom of page). It is truly as blue as the photos indicate. Like all of our photos, this was shot outdoors with the full spectrum of natural light and the photos are not re-touched. The cuff consists of five lengths of low-dome Sterling wire, spread wider in front to form a solid foundation for the Sterling plates on which the clustered stones are set. The component wires of the cuff taper in width on the sides and are fused with caps at the terminals to assure structural integrity. Vertical bar appliquées are also used to strengthen this cuff between the large cluster and the side clusters. This is a classic, simple cuff design often used by Zuni Pueblo smiths in making cluster bracelets. Hallmarked "P.J. BEGAY" and stamped "Sterling" inside the cuff. Large Center Cluster: center oval 9/16" x 7/16"; 28 surrounding ovals ranging from 5/16" x 7/32" to 3/8" x 1/4" to 7/16" x 3/8"
Side Clusters: thirty ovals; 15 ovals in each cluster ranging from 5/16" x 1/4" to 1/2" x 1/4"
Width dead center: 2 3/4" Width at terminals: 7/8 "
Terminal to terminal: 5 1/2" Gap: 1 1/2"
Note on Persian Turquoise: We can add little to the Wikipedia turquoise listing which includes several references to Persian turquoise. In short, Persian turquoise is almost certainly the earliest mined turquoise, perhaps mined as early as 5500 B.C. It probably came to be called turquoise because 16th century Venetian traders bought it in Turkish bazaars and imported it to Europe. For centuries, Persian turquoise continued to come to Europe and the rest of the Occident through Turkey. In the United States, it was most often sold by Armenians of Turkish origin; some residing in Los Angeles, others in New York. The stones in this piece were sourced from Armenians in New York in the mid-seventies, while the Persian stones in Ida Peyton's earrings (see below) were sourced from Armenians in L.A. (also in the mid-70's). This stone was mined in Iran in the last few years of the reign of Shah Mohammed Reza Pahlavi. The subsequent overthrow of the Shah by a movement led by Ayatollah Ruhollah Khomeini and the Shah's flight to New York (to receive cancer treatment at Sloan-Kettering) resulted in the taking of the Amerian hostages at the U.S. Embassy. Since the Hostage Crisis, the U.S. has maintained a trade embargo against Iran and current relations between the two countries have reached a nadir which will only be exceeded by tomorrow's dawning sun. Personally, I'm not expecting to see Persian turquoise legally imported to the U.S. again in my lifetime. 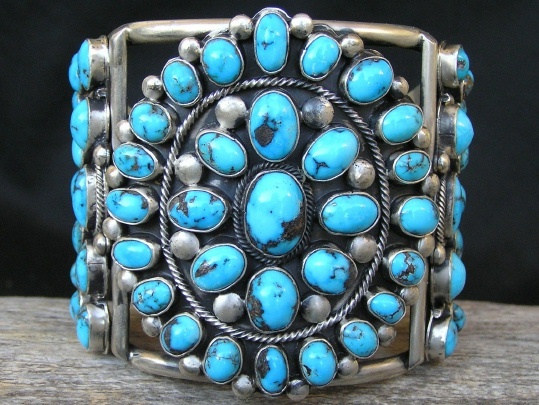 This is legally imported turquoise used in this piece and very little of it remains in the United States.